In critically ill patients the development of acute kidney injury (AKI) is frequent and occurs in 15-64% of ICU patients [1-4]. Uchino et al reported from 29,269 critically ill patients in the ICU from 54 study centers that 30% of patients had renal dysfunction upon entering in the ICU and the prevalence of AKI defined by the need for dialysis to be 6% . Mehta reporting on the PICARD experience (Program to Improve Care in Acute Renal Disease) found 64% of patients in the ICU required renal replacement therapy. Most recently a new classification scheme for AKI was established by the Acute Dialysis Quality Initiative Mortality that defines grades of increasing severity of AKI - risk (class R), injury (class I) and failure (class F)-and two outcomes class (loss and end-stage kidney disease) . Using this classification scheme, Hoste et al found that AKI occurred in 67% of ICU admissions with maximum R, I, F class of 12%, 27% and 28%, respectively . Mortality rates in those requiring dialysis renal replacement therapy ranges between 20-70% [2, 3, 7]. 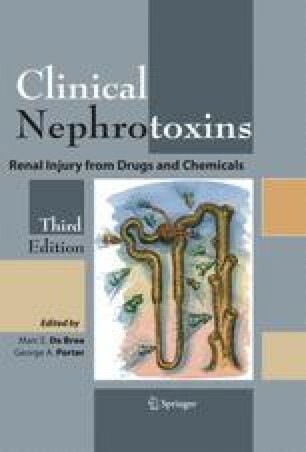 Nephrotoxicity due to drugs contributes to between 8-60% of AKI cases in hospitalized patients [8-12]. However in the ICU, patients are more complex and thus the etiology of AKI is less certain and more multifactorial in nature. Thus, in the ICU the incidence of AKI from drug nephrotoxicity is likely less prevalent than that due to sepsis or hemodynamic alterations. In the ICU setting the incidence of AKI from drug nephrotoxicity ranges between 1-23% [2, 4, 7, 13]. Elderly patients are likely more susceptible to AKI from nephrotoxic agents related to the age related decline in glomerular filtration rate or renal blood leading to reduced clearance of the drug, decline in hepatic clearance, altered free drug concentration .